Below is another article in a series I’m writing as part of my campaign for president of Red Sox Nation. To see the video for the song, “I’m A Member of Red Sox Nation,” or to download the song to your computer for free, click here. From little league/youth baseball to high school to college to the Yawkey Le ague, I played 22 baseball seasons and perhaps 500 games. Unlike Wade Boggs (whom I loved watching play, growing up), I don’t know any of my batting stats from my baseball career – except one. Total home runs: ONE. It happened when I was 14 years old, playing in Brookline’s Babe Ruth League at the playground next to Lawrence School, which is about 1 1/2 miles from Fenway Park. I remember there were no fences – so any four-bagger would have to be legged out. I don’t remember the pitch but it was probably a 57 mph fastball right down the middle. When I struck the ball on the sweet spot of my ultra-light, 29 oz aluminum bat and saw its impressive arc, I knew this was my chance. As I sprinted towards first base, I was already focused on beating the throw to home plate. Nearing third, I saw my coach frantically waving me home, but the look on his face told me it was going to be close. I saw the catcher awaiting a throw from the cut-off man. 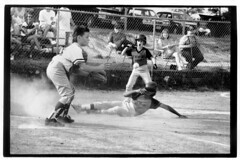 He caught the ball, I slid, he tagged me, and there was a cloud of dust. 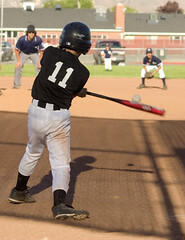 The next moment, before the umpire made his call, is what I remember most clearly. In my memory, time stopped. I recall thinking, “That was close. Was I out or safe? Out or safe? PLEASE say safe, PLEASE say safe.” Then time resumed. “SAFE!” yelled the teenage umpire. HOME RUN. I had done it. Skinny little Rob had hit an honest-to-goodness dinger. “So this is what it feels like to be Fred Lynn,” I thought. It felt really good. And I never got that feeling again, the rest of my days as a ballplayer. Isn’t it funny that I remember that old man’s comment? I suppose that, just as Henry Aaron will always remember everything about his 715th, and Yaz will always remember everything about his 400th (I was there), I’ll always remember everything about my first…. and only. To read an article about my candidacy that appeared on the front page of The Brookline TAB and The Wellesley Townsman on Thursday, September 6, click here. This entry was posted in A+ Articles by Regular Rob, Baseball, Children, Family, Life, Red Sox Nation, Sports. Bookmark the permalink. Went to the Orioles game on Sunday with my 4.5 year old daughter. We sang your song all the way to the game, pretty much. back to dancing in the aisle with her friends. Meanwhile, it’s a really good game. Papelbon blow away the final hitter. song for 15 or 20 minutes. Then, she falls asleep. A GREAT day for a new member of Red Sox Nation.